In which R.D. Burman goes mental. 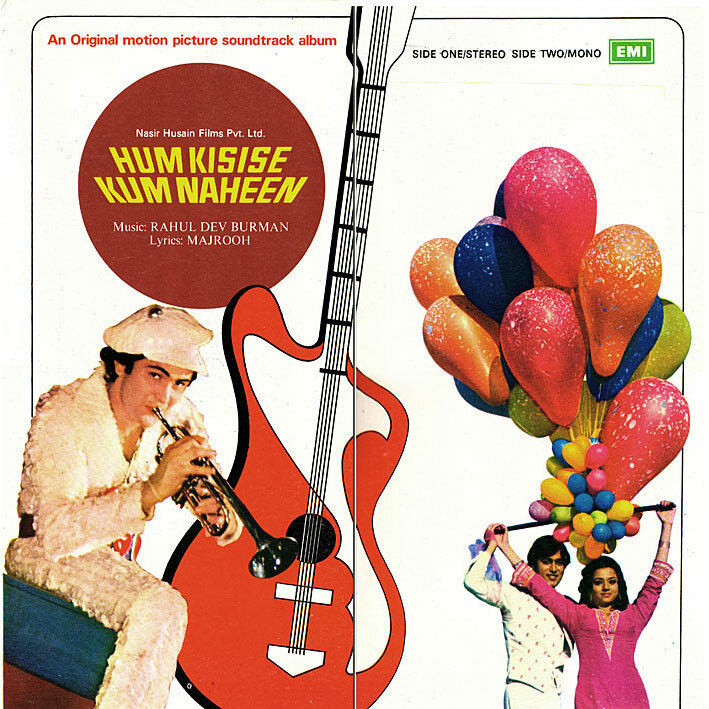 'Hum Kisise Kum Naheen' [review] is where he throws in everything and the kitchen sink... chase-funk, sweet pop, weird keyboards, shouting, stabbing horns, rock 'n' roll guitars, a cheeky rip-off from Abba's 'Mamma Mia'... and that's just the 10-minute medley that starts the album off. Elsewhere there's 'Bachna Ae Haseeno' with its Hammond (I think) organ and electric piano intro, spacey trumpets and frenetic guitars, 'Kya Hua Tera Wada' which almost has a reggae feel to it plus a violin solo, and 'Yeh Ladki Hai Allah' which starts off like a Sun Ra moog piece, before turning into the loveliest of bossa-tinged pop songs. Totally bonkers, amazingly fun. haha! Great - this is a totally insane movie too! Thanks! Bought this lp in India, but the quality of the lp sucked. Thanks for posting this! Re-uping and new posts will commence next week I hope. Thanks very much - It's a great one! Watched the film this weekend, and the visuals match the music perfectly! :-) Am glad to have the beautiful qawwali, it's not included on the CD or anywhere else that I've found.